An hour East of Suncadia is The Columbia River Gorge. Home to the Gorge Amphitheatre and a haven for watersports enthusiasts, the Gorge offers an arid climate and sunsets that seem to last forever. 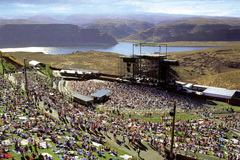 The Gorge Amphitheatre for the ninth time in the past ten years has been voted thebest major outdoor concert venue in North America by the readers of Pollstar magazine. Concerts run from April through September and attract top talent including Sting, Bob Dylan, Aerosmith, and Dave Matthews Band. You can view a current concert schedule here.